One word caused the most stir. A five-letter word that George W. Bush uttered 3,000 miles away, one week ago today, at a gathering of minority journalists. Last week at the Unity: Journalists of Color conference in Washington, D.C., Seattle Post-Intelligencer Editorial Page Editor Mark Trahant, a Shoshone-Bannock Indian, asked President Bush his views on what tribal sovereignty meant. Question: What do you think tribal sovereignty means in the 21st century, and how do we resolve conflicts between tribes and the federal and the state governments? 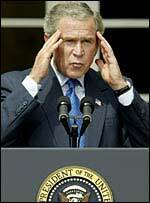 President Bush: Tribal sovereignty means that; it's sovereign. You're a — you've been given sovereignty, and you're viewed as a sovereign entity. And, therefore, the relationship between the federal government and tribes is one between sovereign entities. Now, the federal government has got a responsibility on matters like education and security to help, and health care. And it's a solemn duty. And from this perspective, we must continue to uphold that duty. I think that one of the most promising areas of all is to help with economic development. And that means helping people understand what it means to start a business. That's why the Small Business Administration has increased loans. It means, obviously, encouraging capital flows. But none of that will happen unless the education systems flourish and are strong, and that's why I told you we've spent $1.1 billion in the reconstruction of Native American schools. Speaking at the Unity: Journalists of Color convention in Washington, D.C., last Friday, President Bush, responding to a question about what tribal sovereignty meant in the 21st century, said: "Tribal sovereignty means just that; it's sovereign. You're a — you've been given sovereignty, and you're viewed as a sovereign entity." To many Native Americans — and Democrats, alike — the president's answer spoke volumes about what they see as his ignorance of Indian issues. 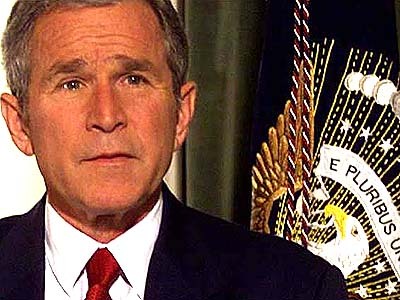 And to many, the operative word in Bush's response was the verb "given." As the continent's first societies, American Indian tribes hold their status as sovereign nations with an almost sacred reverence; an inherent standing as self-governing, independent bodies dating back millennia, something that's always existed. Sovereignty is "the nearest and dearest, No. 1 issue in Indian Country," said Jacqueline Johnson, executive director of the Washington, D.C.-based National Congress of American Indians. "It's not something that was given to us. As tribes, we see sovereignty as something we've always had." As both campaigns swing into the Northwest today, with Bush speaking at a Medina fund-raiser this evening, they are "putting a lot of focus on Indian country and the Native vote," said Alyssa Burhans, a member of the Confederated Tribes of Warm Springs in Oregon and the Native Americans organizing director for National Voice, a non-partisan get-out-the-vote project. And for good reason. In recent elections, the Indian vote, which political observers say traditionally has gone to Democrats, has been credited with deciding several prominent elections. In Washington's U.S. Senate race in 2000, Slade Gorton arguably lost his re-election bid due to Indian voters and those sympathetic to issues affecting them — thanks in large part to a negative ad campaign against Gorton run by the First American Education Project, an Olympia-based political advocacy group founded by several prominent tribal leaders. And in South Dakota in 2002, Tim Johnson squeaked out a 524-vote victory for a U.S. Senate seat — a win he has since credited to the strong voter turnout among that state's prominent Indian population. This week, both Bush and Democratic challenger John Kerry campaigned in Southwestern states, with Kerry meeting tribal leaders in Arizona and New Mexico and Bush touting his Indian housing and health care policies in New Mexico, where about 9.5 percent of the state's population is Indian. To prospective Indian voters, sovereignty is an issue steeped in legal meaning that drives Native American stances on public policy, court cases and tribes' core "government-to-government" dealings with the United States. And it's a status that many indigenous people see as falling increasingly under attack. With the erosion of tribal sovereignty, some say, so too comes the weakening of tribal rights, traditions and customs, and essentially, the American Indian's way of life. So, unsurprisingly, the president's view that sovereignty was something "given" to tribes — and conversely, some fear, is something that could be taken away — carried much weight in Indian Country. Four years ago, then Gov. Bush said that in a Texas tribal dispute, state law trumped the tribe's position. But last week Bush's answer was different. 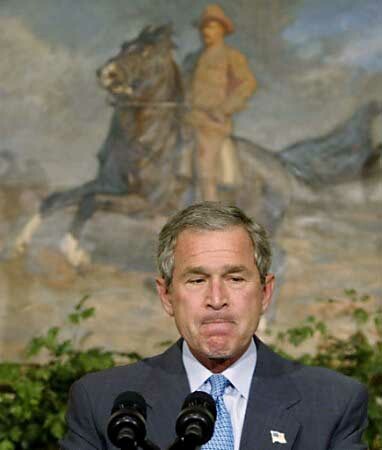 "Tribal sovereignty means just that, you're a sovereign," Bush said. When conflicts arise, he said they should be worked out sovereign to sovereign. That was the good part. But then he said "sovereignty" was given to tribes. That would have been hard to accomplish since tribes were sovereign long before there was a gift-bearing United States. When Bush launched his presidential campaign in 1999, he also said, "My view is that state law reigns supreme when it comes to the Indians, whether it be gambling or any other issue." It seems clear he still doesn't understand what tribal sovereignty means, much less what it entails.